Pintrest Intrest - Pinsperiments From You! The first pinsperiment is in! Hayden Clark from Kennesaw, Georgia; and a very good friend of mine; has shared two recipes that she found on Pintrest that she has tried, tested, and brought to everyone with great reviews! 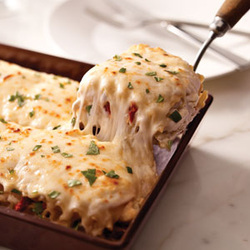 The picture on the left is Creamy White Chicken and Artichoke Lasagna; click on the picture for the link to get to the recipe. The picture on the right is Penne Pasta in a Sun-Dried Tomato Cream Sauce; again just click on the link to get to the recipe! Thank you Hayden for these DELICIOUS looking approved Pinsperiments! Want to Submit your own Pinsperiment?